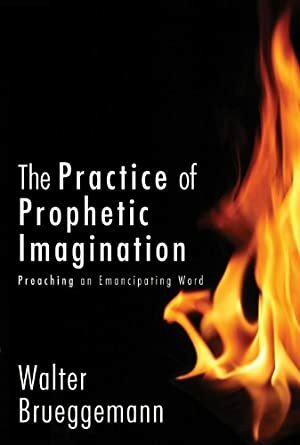 The necessary context of prophetic preaching, Walter Brueggemann argues, is "a contestation between narratives": the dominant narrative of our time, which promoting self-sufficiency at the national level (through militarism) and the personal (through consumerism), and the countervailing narrative of a world claimed by a God who is gracious, uncompromising -- and real. In previous work Brueggemann has pointed us again and again to the indispensability of imagination. Here he writes for those who bear responsibility for regular proclamation in communities of faith, describing the discipline of a prophetic imagination that is unflinchingly realistic and unwaveringly candid. Track It. This book has been $4.45 within the past year. Log In to track Walter Brueggemann on eReaderIQ. to be notified each time the price drops on any book by Walter Brueggemann. to stop tracking Walter Brueggemann. We started tracking this book on January 30, 2013. The price of this book has changed 42 times in the past 2,274 days. The current price of this book is $13.80 last checked one day ago. This lowest price this book has been offered at in the past year is $4.45. The lowest price to date was $4.45 last reached on March 8, 2019. This book has been $4.45 one time since we started tracking it. The highest price to date was $14.75 last reached on November 27, 2017. This book has been $14.75 5 times since we started tracking it. We last verified the price of this book about one day ago. At that time, the price was $13.80. This price is subject to change. The price displayed on the Amazon.com website at the time of purchase is the price you will pay for this book. Please confirm the price before making any purchases.